Click here to download or subscribe to the Poker Stories podcast on iTunes. Poker Stories is a new, long-form audio series that features casual interviews with some of the game’s best players and personalities. Each episode highlights a well-known member of the poker world and dives deep into their favorite tales both on and off the felt. 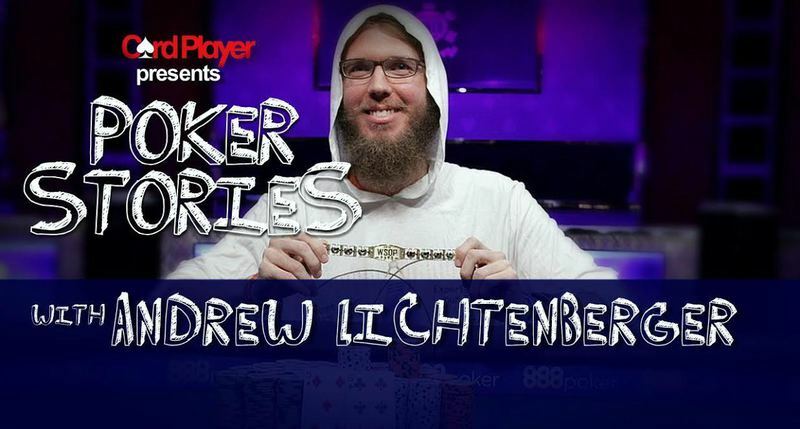 Andrew Lichtenberger, known by many as “Lucky Chewy,” broke onto the poker scene back in 2009 when he finished 18th in the World Series of Poker main event. Most recently, he won his first bracelet at the 2016 series. The New York-native has nearly $9 million in live tournament earnings and another $3 million online. The 29-year-old also keeps himself busy away from the felt, with an online poker site with LuckyChewyPoker.com, a clothing line and even a book called Yoga Of Poker: A High-Stakes Journey To Freedom. Highlights from this interview include smuggled daycare cereal, bowling with children, an insurmountable mountain/hill, the tempo of Celtic folk music, being an unattached, modern man, inspirational Uber drivers and an $80,000 cooler. You can check out the entirety of the audio interview in the video at the top of the page or download it directly to play on the go from iTunes or your favorite podcast app. Catch up on past episodes featuring Brian Rast, Scott Seiver, Matt Stout, Jesse Sylvia and Jason Koon. If you like what you hear, be sure to subscribe to get the latest episodes automatically when they are released.